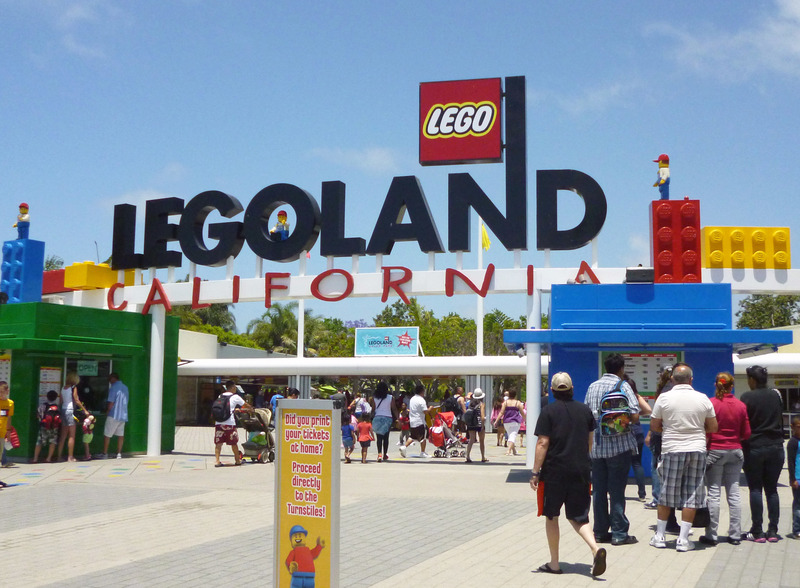 The Legoland California Resort has four main parts: Legoland California, Sea Life Aquarium, Legoland Water Park and the Legoland Resort Hotel. Use this comprehensive guide to help navigate your adventure! Geared towards ages 2-12, Legoland not only offers more than 60 Rides, shows and attractions, but there are also Lego details throughout them all! Legoland is located in Carlsbad, just East of Hwy 5. Legoland offers discounts throughout the year. Depending on the season you may even get additional free days or free children’s admission (children 2 and under are always free). If you decide to upgrade your ticket to an Annual Membership you have 30 days in which to apply the price of that ticket toward membership. The Rainy Day Promise is if the weather should close a portion of the rides for more than 2 hours, it ensures that if you keep your ticket, you can redeem it within 6 months of the visit for free one day visit (cannot be used with Memberships or Complimentary Tickets). Twilight Rate: Get into the Park for 50% off. Guests can purchase a 1-Day, Same Day ticket 2 hours prior to the Park’s scheduled closure (not available Saturdays in October. Legoland is open daily during Summer, Holidays and Spring break, during select seasons they close on Tuesdays and Wednesdays. Your best bet is to check the hours beforehand, so you’re not met with any surprises. Toll and Ticket Booths open 45 minutes before the turnstiles. The park officially opens at 10am, but during summer months turnstiles and some rides will open at 9:30am. Tip: Skip Preferred Parking. Even the furthest space is not too bad of a walk. Tip: Download the Legoland Mobile App which features: an interactive map, ride wait times, daily entertainment guide, ride information with height requirements and much more! Throughout the park you’ll find display cases of Minifigures waiting to be traded, or look at the name tag of any Lego Model Citizen and just ask to trade! Tip: Bring Snacks and Water! There are lots of great restaurant options, but snacks are great for the little ones, especially if waiting in line! There are Splash Pads and Spraygrounds available to cool off in, perfect for hot summer days. Close to the ocean, Legoland California can be under cloud cover for most of the morning, however, don’t be fooled, the sun rays are still coming through. Tip: Skip long lines by starting at the back of the Park. Walk straight through Miniland and work your way back to the front (East side of park caters to older children, West side to younger). If you have little ones that are too small parents can still enjoy the ride. Inform the attendant, and both parents can have a turn. Also, if you have multiple children, ask if there are Model Citizens that can accompany them on rides – that way everyone can ride together. Tip: Kids Eat Free! Check the dining guide, occasionally kids meals will be free with the purchase of a full priced adult meal 2 hours before closing. What to Do When You’re Two a guide for the smallest of guests. Legoland California has 10 different themed areas. While there are attractions for all ages in each area, the West side of the park caters to younger children, while the East side has the largest, fastest rides. Tip: Utilize Package-Pickup! Each retail outlet has Lego Sets unique to that area’s theme. Any retail item bought can be transferred and held at the Beginning of the park until the end of the day! Tip: Cell Phone charging – bring your own chord just in case the ones provided aren’t compatible. Tip: Reserve ‘N’ Ride is a great way to save time in the busy seasons (summer, holidays and spring break). It’s not really necessary during the Winter months. Tip: Get an Unlimited Digital Photo Pass. Get your pictures from Rides and Character Meet and Greets (Single Day $34.99/Annual $49.99). If you decide to head left, the first area you’ll arrive at is Explorer Island. There you will find the first roller coaster, and two rides for younger children. Tip: Use play areas to entertain younger children, while older ones wait for rides. Dig Those Dinos is located right next to Coastersaurus. Grab a pail and brush from the Dino Dig Store and discover what’s hidden under the sand! Tip: Bring Cash. Explorer Island is the first place you’ll encounter Carnival Games that continue throughout the park. There are also a number of face painting kiosks that are popular as well. One of the newer areas of the park, Heartlake City transports you into the popular LEGO Friends world! Tip: Try a Crepe! A Legoland favorite, try it with Nutella or Berries! Tip: Heartlake Fountain is the first water area in the park. The fountain runs all day, but is paused during LEGO Friends shows. One of the largest areas of the park, Fun Town extends from Heartlake City to the Legoland Water Park. Tip: Duplo Play Town is the ideal place for Toddlers. The small train ride and extra large soft Lego bricks are favorites. Tip: Everyone gets a license after Driving School. You can choose to upgrade to a laminate for a fee. Tip: Don’t skip Adventurer’s Club! Tucked between the Water Park and Brick Brother’s Trading Company, this little scavenger hunt area is easy to miss! Tip: The LEGO Clubhouse offers bricks by the pound, a create your own Minifigure area, and soft serve ice cream. Tip: Utilize the Baby Care Center. Changing Centers, Rocking Chairs for nursing mothers, refrigerator and microwave, this is a great escape from the crowds for some quiet. Pirate Shores is the place to go if you want to get wet (but don’t want to spend the day at the water park). There are water rides, cannons, play area, and dryers. Tip: Locker Rentals and Charging Stations are available by the restrooms took keep your valuables dry and you’re mobile devices ready ($3). Tip: Buccaneer’s Booty has sunscreen, swim suits, towels, hats, flip flops and anything else you might need for water fun. Castle Hill is the quietest section of the park. With winding trails and attractions tucked into corners it’s a nice reprieve from the extra crowded areas. Tip: Try Granny’s Apple Fries! Fried Granny Smith Apples, dusted with cinnamon and sugar, and topped with whip cream. A Legoland original! Tip: Knight’s Smokehouse, one of the largest restaurants, is where you can find BBQ, Craft Beer and a large, shaded outdoor dining area. Tip: The Knight’s Tournament ride has a long wait time and adjusts its speed based on age and weight. If you have littles that don’t like the wait, skip this one. Tip: The Dragon has a small play area near the line for smaller children. The Land of Adventureis an area where smaller kids can not only enjoy the rides, but can also ride most of them by themselves! Tip: The Dune Raiders racing slide sometimes has a longer line. You can skip the line to use the other slides on the far side of the racers. The Imagination Zone holds the biggest rollercoaster in the Park, The Lego 4D Movie Theater, and Mindstorms. Tip: Sign up for Mindstorms early. Kids 9 years and older can sign up for this robot building workshop. Tip: Don’t miss the Lego 4D Movie! If you were a fan of the original Lego movie, the New Adventure, is a great follow up. Filled with clever jokes and a fun story line, it’s a great time for the whole family. The newest area in Legoland, Lego Ninjago World has a Ninja Training Course for smaller kids and the popular interactive Ninjago Ride. Tip: The Lego Ninjago Ride is a great interactive experience, making you feel like you are part of the action. However, It is dark and loud, with some scarier elements. If you have smaller children, they may want to wait outside and do some Ninja Training! At the center of Legoland you’ll find Miniland USA, an homage to all the greatest cities in the US. Over 32 Million Bricks make up this amazing garden. On the upper deck lies the Star Wars area, complete with Death Star! Tip: Don’t miss the model shop! Watch as builders maintain and build the LEGO sculptures that grace all of Legoland. Sea Life Aquarium can be enjoyed on its own or added onto a Park Hopper Ticket to Legoland California. The hour+ experience is a nice reprieve from the park, or a great way to spend an afternoon on the days Legoland California is closed. The Aquarium has 14 interactive exhibits, with over 5,000 creatures, that allow the public to experience ocean wonders, while hearing Sea Life’s message to Breed, Rescue and Protect. Interactive Touch Pool: touch and feel sea stars and more. Shoaling Exhibit: where hundreds of fish swim around you in a circular tank room. Jellyfish Discovery: See Moon Jellies big and small in this disco room. Shark and Ray Lagoon: Come face to face with a smiling Ray as they swim by. San Francisco Harbor: See Eels and maybe catch the Octopus stretching its tentacles. Tropical Ocean Exhibit: The heart of the aquarium tunnels you through the ocean itself. Tip: Grab a Dive Log Book on the way in and use it to log the interactive dive stations. Turn it into the shop at the end and receive a Lego Dive Hat! Tip: Eat at the Cafe. The restaurant at the end of the journey is a great place for lunch. They make Macaroni and Cheese to order and the sliders are big enough to share! Tip: During busy months, strollers must be parked outside. The Legoland Water Park is massive; rides, slides, wave pools, lazy rivers and more, you could spend your whole day here. Located at the back of Legoland California, you can upgrade your ticket for $30 to access the Water Park. For passholders, the waterpark is a big perk. Build-A-Raft-River: Large floating Legos can be used to build up rafts (Minimum 42”). Duplo Splash Safari: Pool for kids 6 and under with shallow water and smaller slides (must be accompanied by an adult). Joker Soaker: A large clock tower surrounded by water cannons and soaked with 350 gallons of water that drops from a bucket every few minutes. Orange Rush: Slide down a giant water slide in a raft built for 4 (Minimum 42”). Pirate Reef: Race a boat down between two battling pirate ships equipped with water cannons. Splash Out: Single rider blue water slide (Minimum 42”). Soak N’ Sail: Water soaked jungle gym that has a 300 gallon bucket pour down every few minutes. (Guests under 36” or younger than 10 years old must be accompanied by an adult). Splash Zoo: Spray and play area for children ages 1-3. Tip: Children 2 and Under will be charged a $5 fee to enter the Water Park. Tip: Life vests are available for small children. Tip: Swim diapers are required for children 3 and under. An extension of the Legoland Water Park, Chima adds a wave pool, medium sized slides and a Build-a-boat area. Cragger’s Swamp: Shallow pool with small and medium sized water slides. Partially open, Surfer’s Cove is the newest addition to the water Park. Wipeout Lagoon with water jets. Riptide Racers: Water slide race between 6 racers. Tip: Locker rentals available (Single $10/Family $14). Tip: Seating and shade are on a first come first serve basis, if you plan on staying all day show up early to secure your spot. Tip: Consider Cabana Rental. Cabanas come with considerable perks, including souvenir towels, front of the line passes and more. Just steps from the Legoland California entrance is the Legoland Resort Hotel. Lego dragons, fountains, Pirate Ships and Castle, greet you when you walk in. A wonderful extension of the park, the Hotel offers plenty. Interactive Lego features throughout hotel. Pool (8am-9pm daily) with Cabana Rentals and movie nights. Tip: Check Out the Elevators for a disco dance party! Tip: Meeting people at the Park? The Legoland Hotel lobby has a lounge and play area for kids, A great, cool place to meet up. What’s your favorite thing to do at Legoland?